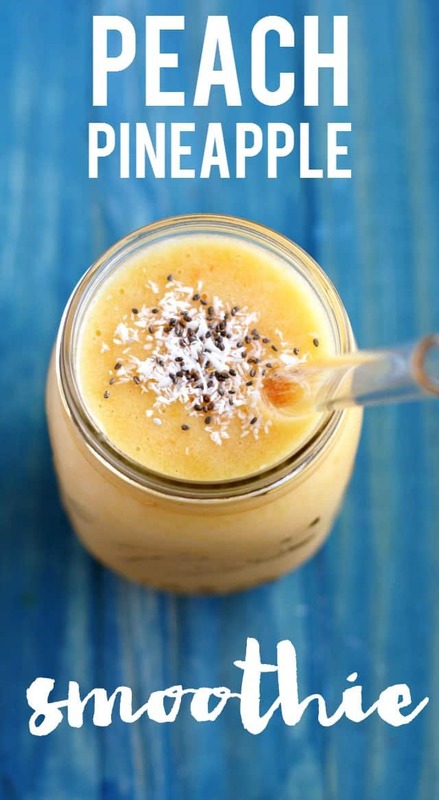 Home » Breakfast » Frosty Peach Pineapple Smoothie. 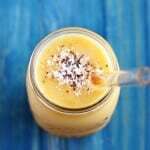 This frosty peach pineapple smoothie is a cool and refreshing breakfast or snack! 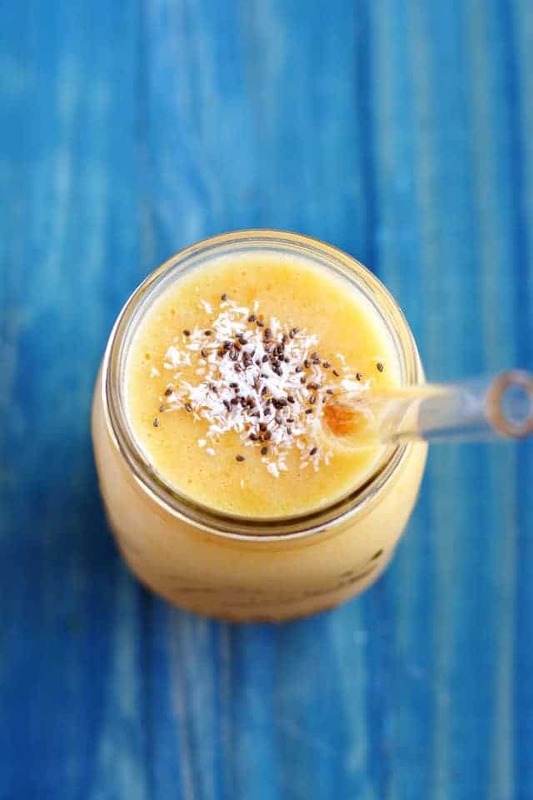 Enjoy a taste of the tropics with this dairy free smoothie recipe. Smoothies aren’t just a summer treat – they can be a healthy breakfast or after workout snack at any time of year! This peach pineapple smoothie is my favorite smoothie right now. The peach and pineapple combination with a little bit of coconut milk is so light and refreshing, plus it’s so easy to make on busy days. 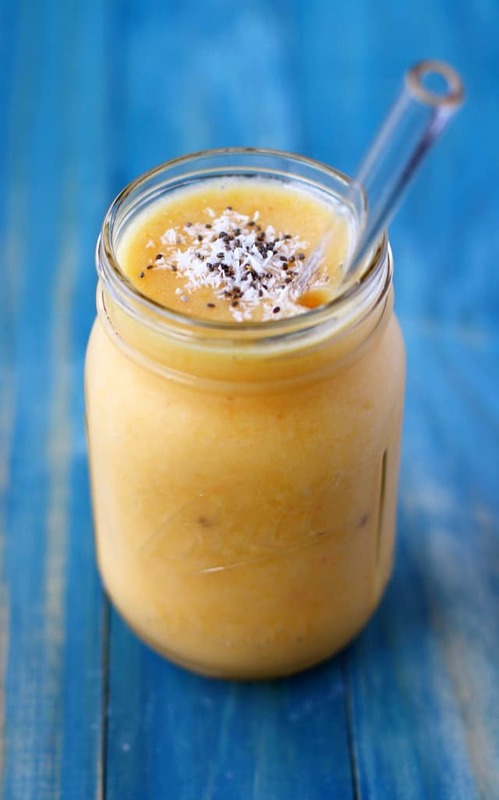 When peaches aren’t in season, I like to use frozen pineapple chunks and frozen peach slices in this smoothie. One little drawback of the frozen peaches is that they tend to be on the tart side. To combat that, I have been adding a little bit of maple syrup. You can adjust the sweetener based on how ripe your fruit is – I would expect that if you have really ripe fresh peaches, you won’t need any sweetener. This smoothie is best enjoyed right after you make it. If you make it and then store it in the refrigerator, it will separate, and it will thaw somewhat. It won’t have the same texture as right after you blend it. Can you use frozen pineapple in a pineapple smoothie? Yes, you can use frozen pineapple in this smoothie. If you have a fresh pineapple, you can dice it up and freeze it to give this smoothie a thick and frosty texture. Can you make a pineapple smoothie without milk? 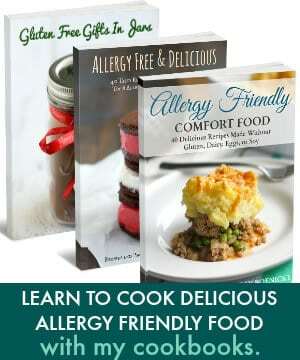 Yes, if you are dairy free, go ahead and use your favorite non-dairy milk. You could also use pineapple juice, coconut water, or a little plain water. Place the frozen peaches and pineapple in a blender. Let thaw for a few minutes. Add the non-dairy milk and any desired sweetener. Blend on high until very smooth. 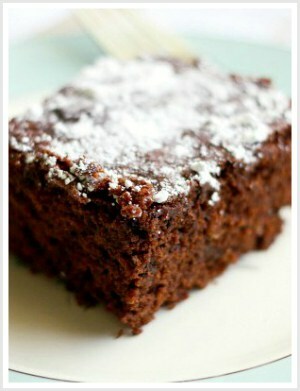 Top with chia seeds and coconut milk if desired. Enjoy! A frosty and delicious peach pineapple smoothie recipe that's perfect for a summer breakfast or snack! Place the frozen fruit in the blender. Let thaw slightly for about 10 minutes. Add the coconut milk and blend on high until very smooth. Taste and see if sweetener is needed, if so, add maple syrup, and blend again for a few seconds. Pour into a glass and top with chia seeds and coconut. If you like smoothies, try this berry smoothie or this chocolate strawberry smoothie. The summer is breezing by so quickly! I’m losing track too. Summer’s my favorite season, so I wish there were a way to get it to slooooooow down. This smoothie looks SO goood! I want to slurp it through that mega cool straw! I know, I want to slow it down, too! More summer, less winter, please! This smoothie sounds fantastic, Kelly! I’ve never combined peaches and pineapple before, so I’m loving this combination. What a refreshing drink! this sounds so good right now, especially in all the humidity and heat! Oh my goodness, this smoothie just speaks summer! Totally crushing on all that tropical goodness! 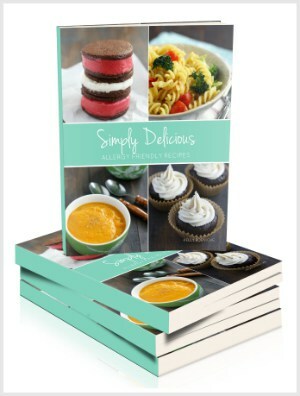 But yumm, love simple recipes like this! This looks like a refreshing treat! Love the combination of fruit. Yumm! Love the flavour combination.. delicious.. PERFECT summer food. Er, beverage? Er, drinkable food? This smoothie sounds so tropical and refreshing! Perfect for hot summer mornings. Your trip to the zoo looks so fun!